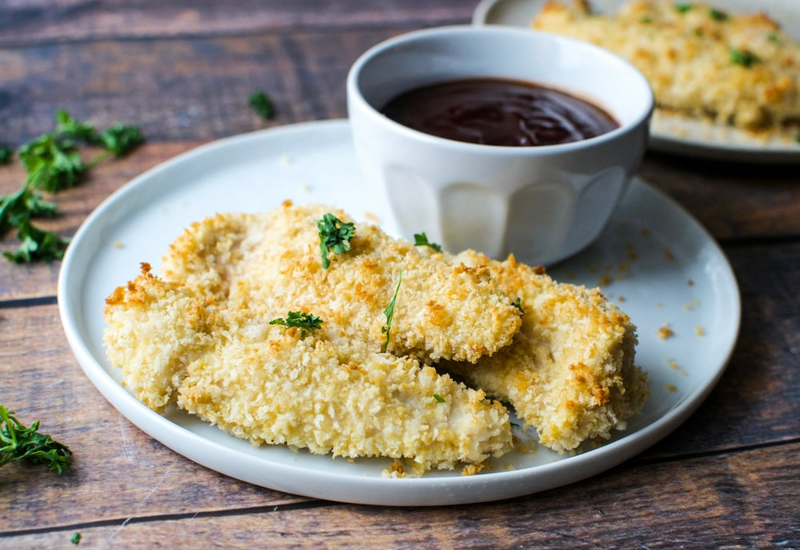 This recipe for homemade chicken fingers is a healthy upgrade on the fast-food favorite. That way, you can satisfy your cravings without the guilt. They're baked, not deep-fried, and still crispy from panko breadcrumbs. Seasoned with garlic, parsley, and dill, these chicken tenders are full of flavor. The dish is ready in 20 minutes, making it perfect for busy weeknights. Even the pickiest of eaters will clean their plates with this one. Serve these chicken tenders with any sauce you'd have with chicken nuggets. Some of our faves include honey mustard, sweet and sour, barbecue, spicy buffalo and creamy ranch. Set out an assortment and watch these chicken tenders get devoured. Per Serving: 876 calories; 20g fat; 91.2g carbohydrates; 77g protein; 256mg cholesterol; 1364mg sodium. These baked chicken tenders are so crispy and delicious. I love that they're not fried, but instead baked. The Italian-style seasoning is so good! I made these initially for the little ones, and they loved it, but ended up sneaking some for myself, ha! Very good chicken tenders. The panko bread crumbs were crispy and delicious. If you put them in the oven on broil for a couple minutes at the end, they will crust up nicely with a good golden color. Not bad for baked tenders. Served them with honey mustard sauce which the kids really loved. The flavor is wonderful, and the panko bread crumbs were nice. I still think I prefer fried tenders but I'm trying to clean up the way I eat. Made bite size nuggets instead of tenders, and followed the recipe for the crunchy crust. The dried herbs and garlic were really good in the panko mixture. I served it with creamy ranch, my favorite. I make this recipe all the time for my kids. Much better than fast food and I don’t have to fry it in oil either. The panel breadcrumbs work well, sometime I use seasoned ones or make my own spice blend.